Living a social life has become common these days. We like to share information with friends and discover new things from friends. We also want to let our friends know if we come across anything interesting. Facebook has made sharing in life extremely simple and easy. Activities you perform on Facebook and beyond can reach your friends through Facebook. This has been made possible by Facebook Connect (open graph), currently being implemented on several websites and apps. Sometimes, however, sharing too much information can be a potential threat because some unwanted users, in your unawareness, might be able to see some data you shared on Facebook – something they weren’t supposed to see. Such privacy issues pose serious security problems for you. Maintaining and managing a Facebook profile and making sure that no important information is shared publicly on your profile, is quite a daunting task. Secure.me protects your Facebook profile from potential threats and notifies users of their security status automatically. It provides possible suggestions to improve the security of the user profile. Once you give permissions to the app, it will scan your entire network on Facebook (including your friends and Apps you use) and try to identify possible threats. It acts as an Antivirus for Facebook. Additionally, Secure.me also has browser extension called App Advisor that rates Apps on Facebook. The app shows current ratings of a particular app as well as its reputation. If a particular Facebook app has moderate or bad reputation, it is recommended not to use such apps. The Sign Up process is simply one-click where users can select the Facebook Connect button to log in. After login, the app asks about the Facebook profiles you want to monitor. You may choose to monitor your own profile or any other. The next step is to login to that particular Facebook profile. Once logged in, you can scan the profile for any security issues. 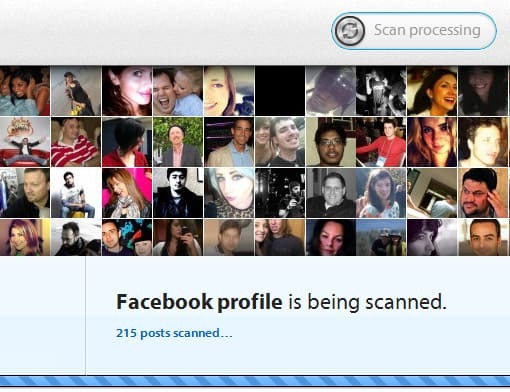 The scanning process takes some time, as it will scan all your Facebook posts as well as people in your network. Finally, at the end of the scan, the app generates some profile stats along with recommendations to improve the profile rating. You can also set Secure.me to automatically monitor changes on the selected Facebook profile. Secure.me along with App Advisor protects your online social life and prevents the unnecessary sharing of important information unknowingly in public. Get Secure.me for your Facebook profile now!